The Coopered Tot: Blood Oath Pact 1 - Luxco Makes A Luxury Vatting. Marketing Hype or Innovation? 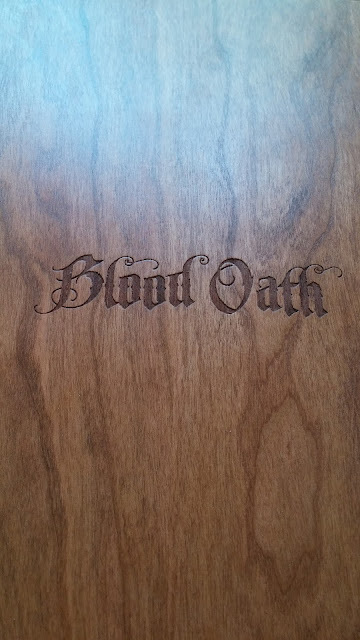 Blood Oath Pact 1 - Luxco Makes A Luxury Vatting. Marketing Hype or Innovation? How popular is flavored alcohol? Ten years ago, you didn’t see anything on the shelf in terms of all the different flavors. Now’s it’s just exploded. The main one I’m focused on now is Pearl. We’ve got 19 different flavors. Other than that, it’s flavored whiskies. There’s cherry, honey. Cocktails are starting to come back, ready to drink – just open and pour. How many flavors are in your lab? Several hundred. I’m constantly updating my library of flavors and extracts. Yes, he talked about flavored whiskies in the same breath as flavored vodka. This is his baby and Luxco is emphasizing his prowess with flavors. I'm wondering, will he vat Bourbon the way he designs whipped cream vodka or cherry Bourbon? In Bourbon & Banter's video from their post announcing the launch of the brand, Rempe talks corporate marketing-ese while cool jazz plays in the background. ..."in bringing this product to market our particular goal was to bring an innovative and unique tasting experience and bourbon experience to the bourbon connoisseur." Later he tells us that the product is designed to deliver "what the Bourbon connoisseur is looking for". He explicitly says that NDPs have an advantage because they are not "tied down" to a spirit that they are producing". It's hard not to wonder whether he considers Blood Oath a flavor blending exercise like he does making Honey Bourbon or Cucumber flavored vodka. Rempe does convey some useful information in the video. 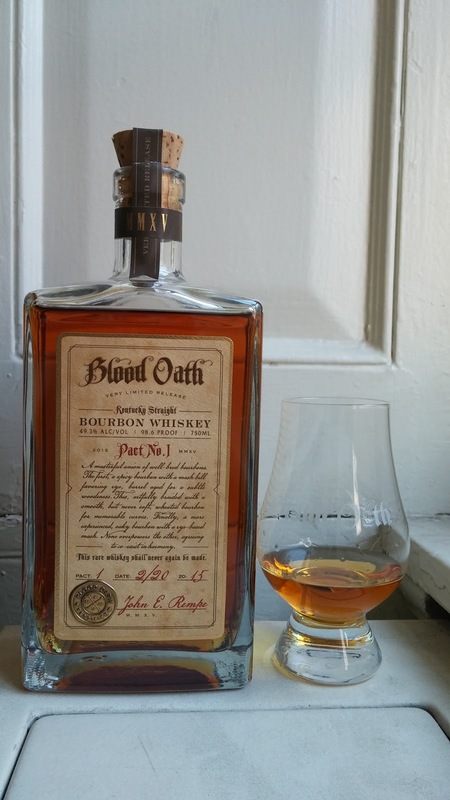 We learn that Blood Oath is a vatting of three Bourbons with two different flavor grain mashes (and that's the extent of the information we are given): a 7 yo rye mash bourbon, a 12 year old rye based Bourbon, and a 6 year old wheat based bourbon. Bottled at 98.6 proof. Yes - the proof is the temperature of blood. Is it just me, or is that a tad theatrical? At least it's a relatively high number. My impression of all this branding stuff is to feel manipulated. I don't buy into the "pirate" or "old west" visual theme of the label. I'm not too romanced by John Rempe talking about hitting a flavor profile for "the Bourbon connoisseur". 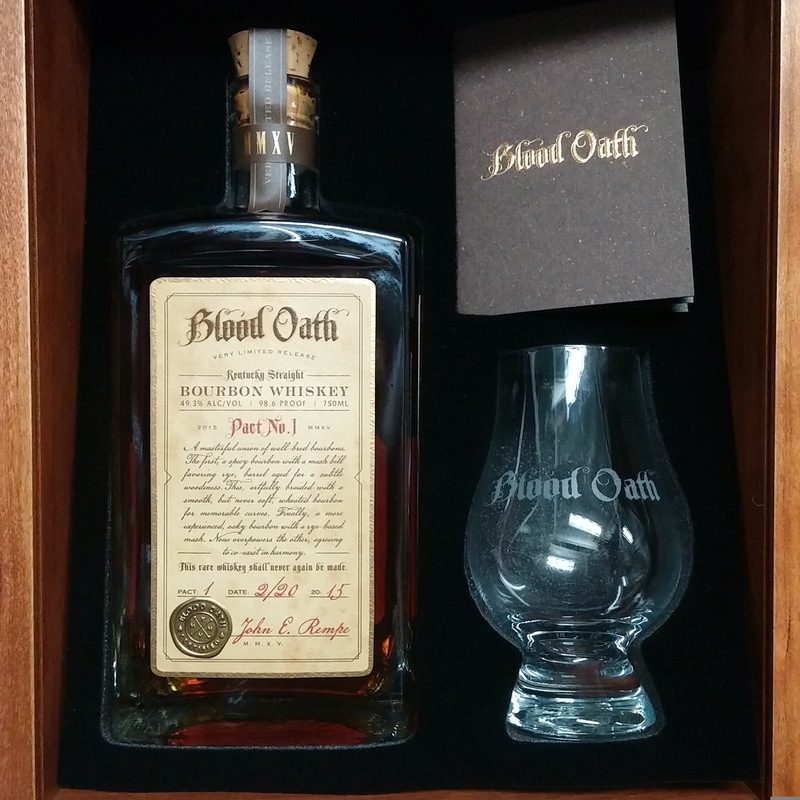 In the video they refer to Blood Oath as a "super premium" Bourbon. All the fancy packaging certainly implies a marketing positioning of the contents as "super premium". But what little we know about the contents doesn't particularly imply super-premium: that the wheat mash bill is 6 year old stocks from somewhere (almost certainly Heaven Hill - in the form of Rebel Yell Reserve) and some 7 and 12 year old rye flavor-mashed Bourbons (Luxco currently sell a 12 year old single barrel expression of Ezra Brooks sourced from Heaven Hill for $36) None of that sounds like something worth $80. I get the feeling that there's an attempt to get with the Bourbon mania and try to tap into the raging market for cult Bourbons, like Buffalo Trace inspires with the BTAC or Heaven Hill does with the Parker Heritage Collection. But there is a vatting story that might be interesting. OK, so throw down - let's get to tasting. All this talk about branding - and either liking the story or not liking the story ultimately doesn't mean a thing if the whiskey isn't good and doesn't seem a reasonable value. The angle here is clearly the vatting. Is it delicious? Blood Oath Pact 1 49.3% abv. 98.6 proof. Nose: vanilla, honey, charred oak, musk, daisies and marigold flowers. Sweet on opening. Fruity candy - juicyfruit. Honey, wine gums. Citrus compote. Candied orange rind. Chocolate, then oak tannin. A drop of water adds sweetness. Vanilla buttercream on top of the honeyed entry. The body becomes a little thicker. The expansion tingles with some blond tobacco. Prickly heat with white pepper spice. The finish is medium long with oak char and tannin bitters. It's an interesting vatting alright. It hits the juicyfruit flavors I like so much in some mid-century dusty Bourbons, but with some freshness and intensity. I poured this for Steve Zeller, the Smokey Beast. Steve like it. Heck, I'm giving it 4 stars - I like it too. It's a little too sweet and open and sunny and fresh to feel like a Bourbon I'd spend a lot of money for. Bourbons that get big bucks, like mid-aged Willett's, Parker Heritage, BTAC, EH Taylor, have darker richer flavor profiles and are bottled at higher proof. But, that said, the flavors here are certainly good and this is an enjoyable pour, even if the comic book branding stuff isn't to your taste. But even if it is, you still need to ask yourself whether it's a good value and, in my opinion at $89.99 retail the answer has to be "no". There are good store picks of Four Roses Single Barrel (with the shiny gold labels bottled at barrel proof) available for $55-$70. There are High West rye based vattings with serious appeal for less. Although the particulars of this Bourbon vatting are a bit different from what's on the market right now, 4 grain vattings aren't totally unique, and this isn't uniquely good at its price level. But the whiskey itself is a perfectly nice pour. I'd just be happier about it if it were sold in a regular bottle at a more moderate price and without the limited edition story. If this is pretty much a vatting of some older barrels of Rebel Yell reserve, Ezra B., and Ezra Brooks black then it could well be a regular expression at a much more moderate price indeed. Are we paying a premium price for some hardware and some fancy printing? That's not really something I'd like to encourage. But with the Bourbon boom in full swing none of this may matter if enthusiasts snap it all up. Disclosure: this review was based on a full bottle I received from the PR firm Common Ground (thanks, Pia). Anyone else notice they are using the same bottles as Diageo's Orphan Barrel series? If I had those bottles laying around i'd vat my own. You'll find Substantial Western side rye primarily based vattings using critical lure pertaining to a lesser amount of.